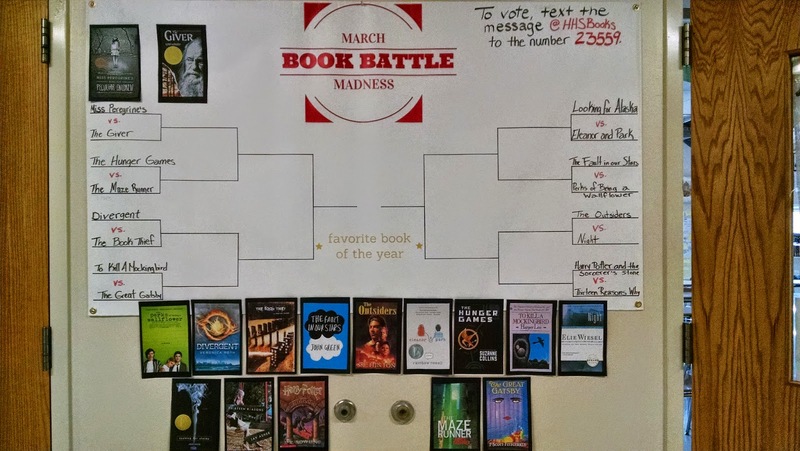 The excitement over our March Book Madness bracket is growing. This past week as our school community voted on books in the initial bracket, I had the pleasure of handing out signed copies of Rainbow Rowell's Eleanor and Park and Patricia McCormick's Sold along with gift certificates to local book stores and copies of Looking for Alaska and Thirteen Reasons Why. And not only have students been getting into our daily voting, but teachers have as well. On Tuesday, I drew the name of a fellow English teacher as the winner of our raffle from all those who participated in the day's voting. She was giddy as I handed her a copy of Thirteen Reasons Why. But yesterday afternoon, the excitement started to really gain momentum. And it all started with an email. From LOIS LOWRY! Oh yes, you read that right. Prior to the start of our voting, I emailed every author in our bracket, explaining our March Book Madness bracket and requesting a signed copy of their book to give away. It is how we received copies of Rainbow Rowell's and Patricia McCormick's books. Well, I also emailed Lois Lowry, author of The Giver, a clear favorite among both our students and teachers. So when I saw that email signed "LL" in my inbox, stating that Lois Lowry was sending a signed copy of The Giver, well I couldn't keep that to myself! I've been using Celly, a text-messaging service, to conduct our daily votes. When I saw Ms. Lowry's email, I shot out a quick text to all our bracket voters sharing the news. Within minutes, I had teachers and students coming up to excitedly chat about their love of The Giver. And then, just a few minutes later, S.E. Hinton retweeted us! I had sent out a tweet earlier in the day from my class account sharing our daily vote between Elie Wiesel's Holocaust memoir Night and S.E. Hinton's The Outsiders. And she retweeted it. By the last bell of the day, I had lost count of the number of students and staff that approached me excited, nearly giddy, wanting to talk about their love of these authors and their books. I'm sitting in the teachers' workroom typing up my Writer's Notebook prompt for my last block of the day, Creative Writing, when my phone buzzes that short zap. Someone has just tweeted me. 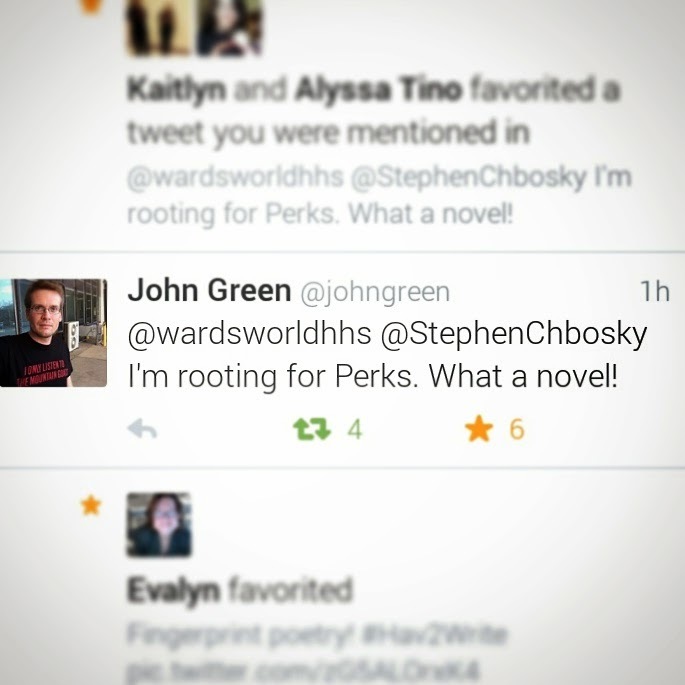 I turn in over and find...JOHN GREEN HAS TWEETED ME! Not a retweet, mind you. He has directly tweeted my classroom Twitter account to put in a vote for today's March Book Madness battle which pits his Fault in our Stars against Stephen Chbosky's The Perks of Being a Wallflower, our closest battle to date. I believe I squealed and that shouted, "Holy crap!" Now this is not normal, every day behavior in our teachers' workroom. The English teacher sitting next to me at the large table in the middle of our workroom just stared at me when I could barely stammer out why I was so excited. I handed her my phone to show her the tweet. And she laughed before clicking a quick photo of my phone to post to Instagram. I quickly retweeted and sent out a message to our student and teacher voters through Celly letting them know about the day's connection. We were giddy! It didn't take long for the buzz to spread. Not thirty minutes later when I walked through the lunchroom for cafeteria duty, a student called out from the din of conversation, "Ms. Ward - I just saw! John Green?! That is sooooo cool!" I love that we had an opportunity to connect with author John Green using social media (on Digital Learning Day, too), but here's the best part: students and teachers are giddy talking about books! These connections have sparked an interest in our community. We're talking about books, making reading recommendations, arguing the merits of one book over another. We are excited, engaged, and connected readers!